Last week I began telling you the design story of Kaladesh. 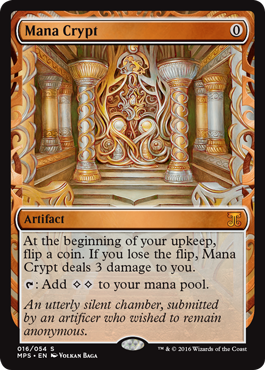 Next week, I will continue that story, but I'm taking a break this week to talk about another exciting thing Kaladesh will be introducing to Magic. I'll explain what it is, walk through how and why it came about, and then show off some pretty cool cards. Hopefully, that piques your curiosity. The Masterpiece Series will exist at a rarity higher than mythic rare. For example, in Kaladesh, you will open a Kaladesh Inventions card roughly 1 out of every 144 boosters. (Technically, the Kaladesh booster pack says the ratio is 1:2,160 cards.) This is slightly more often than opening a premium mythic rare. These ratios may change for future sets. The Masterpiece Series, both in presentation and card selection, will be tied thematically to the world appearing in the block. 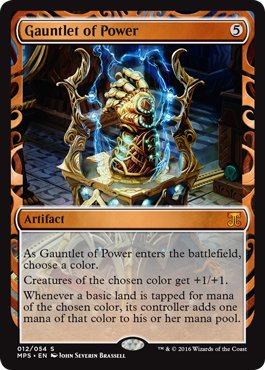 For instance, all of the Kaladesh Inventions will be artifact cards presented as Kaladeshi artifacts. The frame will likewise have a special treatment that ties into the theme of the block. 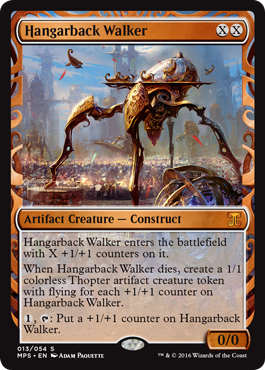 I will be showing off some of the Kaladesh Inventions cards later in this article, so you'll get a chance to see what I'm talking about for our first Masterpiece Series. The frame treatment will be exclusive to the Masterpiece Series it appears in. The number of Masterpiece Series cards may fluctuate, but roughly speaking we expect each Masterpiece Series to be around 50 cards for the whole block. Kaladesh Inventions, for example, will have 30 cards in Kaladesh and 24 cards in Aether Revolt. The large set and small set in a block will have different Masterpiece cards. All Masterpiece Series cards are printed in English, but they do appear in non-English product. The expansion symbol for each Masterpiece Series will be block-specific, but distinct from the sets in that block. For example, the Masterpiece Series cards in Kaladesh and Aether Revolt will share one unique expansion symbol—they won't use the Kaladesh or Aether Revolt symbols. All Masterpiece cards will exist only in premium foil versions. Masterpiece cards are planned for Magic Online, but will not be redeemable and are not counted as part of the set. They're going to be distributed in an exciting new way, but we're not quite ready to announce what that is. Look for that announcement later this month. Masterpiece cards will not exist in Magic Duels. Masterpiece cards can be played in any Limited format they're opened in and in any Constructed format in which the card is already legal. 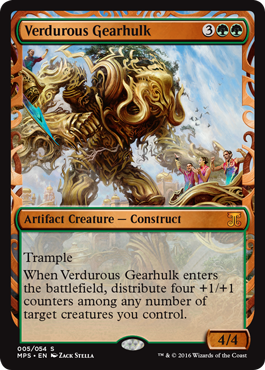 That said, it's time to finally see some Kaladesh Inventions cards. And that, my faithful readers, is the Masterpiece Series in general and Kaladesh Inventions in particular. I hope you all are as excited to see them as we are to make them. I always want feedback, but today even more so as I announced something pretty big. Please feel free to write me an email or contact me through any of my social media accounts (Twitter, Tumblr, Google+, and Instagram) to let me know what you think of the Masterpiece Series and/or Kaladesh Inventions. Join me next week for part 2 of my design story on the making of Kaladesh. "Drive to Work #364—Urza's Legacy, Part 1"
This is the first of a two-part series on the design of Urza's Legacy. "Drive to Work #365—Urza's Legacy, Part 2"
This is the second of a two-part series on the design of Urza's Legacy.